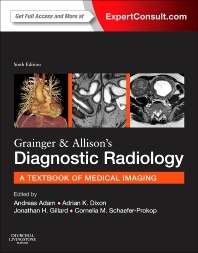 Long recognized as the standard general reference in the field, this completely revised edition of Grainger and Allisons Diagnostic Radiology provides all the information that a trainee needs to master to successfully take their professional certification examinations as well as providing the practicing radiologist with a refresher on topics that may have been forgotten. Organized along an organ and systems basis, this resource covers all diagnostic imaging modalities in an integrated, correlative fashion and focuses on those topics that really matter to a trainee radiologist in the initial years of training. Master the field and prepare for certification or recertification with a succinct, comprehensive account of the entire spectrum of imaging modalities and their clinical applications. 11. CLINICAL GOVERNANCE – INCLUDING AUDIT, MEDICO-LEGAL ASPECTS, ETC. 49. METABOLIC AND ENDOCRINE DISEASE OF THE SKELETON – INCLUDING BONE DENSITY ETC.